Excavating in Egypt at the turn of the century, three Englishmen search for the 4,000-year-old tomb of Princess Ananka (Yvonne Furneaux), high priestess in the court of the god Karnak. The eldest explorer is Stephen Banning (Felix Aylmer), and his companions are his son, John (Peter Cushing), and Joseph Whemple (Raymond Huntley). Ignoring the warnings of a mysterious Egyptian, Mehemet (George Pastell), their digging finally reveals the treasure gallery and the sarcophagus of the beautiful princess. A sudden shock causes the elder Banning to go mad, and the expedition returns to England. Three years later, John and his lovely young wife, Isobel (Yvonne Furneaux) o are baffled by the old man's premonition of impending death. When he is fiendishly murdered, followed by the weird killing of Whemple, John is attacked by a monstrous, terrifying, and seemingly indestructible giant. the ancient gods, he returns to life in all his mummified hideousness to destroy those who have desecrated the sacred Egyptian tomb. Commanded by Mehemet, The Mummy goes on his murderous rampage, and only the startling resemblance of Isobel to his long-dead princess keeps him from crushing John to death. The speechless, tormented monster kills his Egyptian master, and carries the frightened girl away with him. 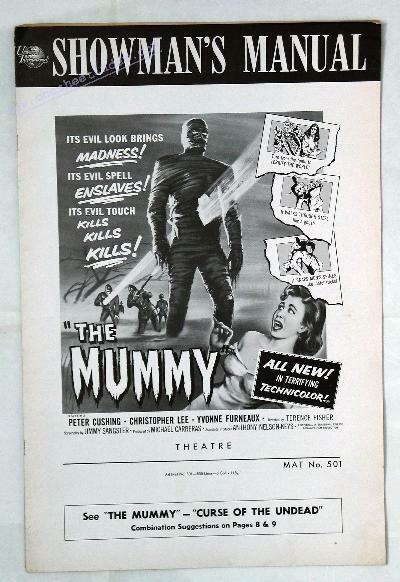 Banning follows with police and townsmen, and their deadly assault of high-powered bullets finally disintegrate the grisly hulk, and The Mummy forever disappears under the slimy swamp from which he had returned to life for his Pharoah's revenge of deathly destruction.